My previous post was a step-by-step guide on how to make almond milk, so I created a delicious vegan gluten-free cookie recipe made from all the leftover almond pulp. These cookies are a bit crumbly but great if you want a healthy alternative to your regular homemade or store bought cookies. Hopefully this recipe will inspire you to make your own nut milk! I added a combination of cocoa, dates and coconut flakes along with a splash of almond milk. After they’re finished baking, sprinkle some powdered sugar on top. Enjoy these healthy cookies with your friends over the holiday season. This is what the leftover almond milk pulp should look like. I had about 2 cups. Chop and mash dates into a paste. 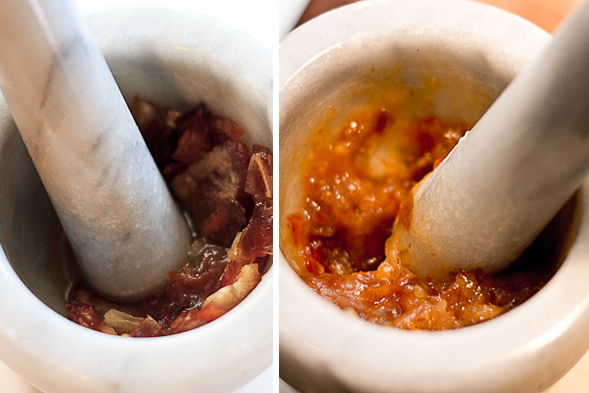 I used my mortar and pestle and added a splash of water for ease. Roll cookie batter into balls. 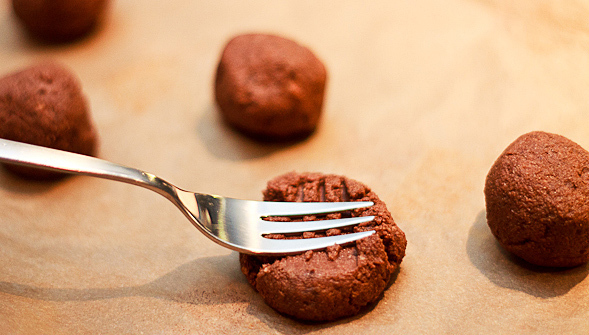 Press and criss cross cookie balls with a fork. Bake for about 30 minutes. 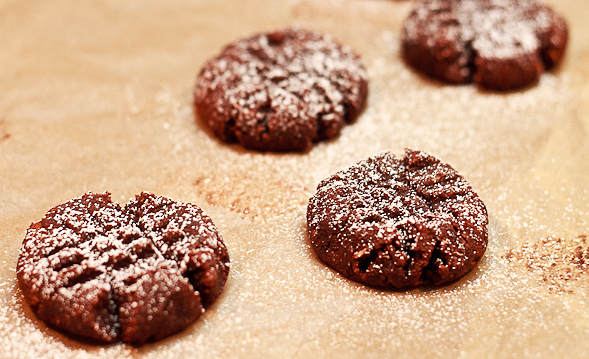 When finished baking, sprinkle with powdered sugar. Preheat the oven to 350°F. Line a cookie sheet with parchment paper, set aside. Combine all ingredients in a bowl and mix thoroughly. Roll mixture into 12 to 18 balls and then flatten in a criss-cross pattern with a fork. Bake for 30-35 minutes. Sprinkle with powdered sugar. Thank you, Sara! Yeah, I hate wasting food so whenever I make almond milk I try to come up with ways to use up the leftover pulp. YUM! 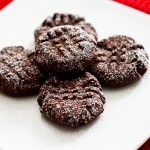 I just tried this recipe and they actually taste buttery! How is that possible? These are definitely very good and a great way to use leftovers from almond milk…. I would go so far to say that its even an INCENTIVE to make the milk! I added a handful of raw slivered almonds and would probably add a little more sweetener next time, but seriously delicious! Thank you so much Lisa! The buttery flavor is probably from the coconut oil/flakes. Really glad you enjoyed those cookies. So have you made the almond milk yourself, how did it come out? Your recipe says 2 dates. Is that correct? Really dying to try the recipe. just made almond milk. I think I like it, except its very slightly bitter. next time i shall take the skin off, but i feel that would waste a lot of nutrition. Yes, two dates is what I’ve used but you can probably use 3 and cut down a little on the sugar if you want. Glad you liked the almond milk, and yes, try removing some of the skins (I typically remove it for half the almonds and keep the rest). There’s other variables too: Did you use too much vanilla extract maybe? How much sugar or dates did you use? The blender is also important, it works best with a powerful one. On the top right (right below my picture) you can search the site, enter “almond milk”, I have a few recipes. What a smart idea and these cookies look terrific! Was I supposed to use sweetened cocoa powder? I just made these and they are not sweet at all. :/ Almost taste like raw cacao. Thanks for the feedback. It’s not a very sweet recipe, but definitely has a lot more sweetness than just raw cacao. Did you use the dates, sugar and powdered sugar for sprinkling? I just made almond milk and have leftover almond pulp. So a couple questions, first are you supposed to let the almond pulp dry out? And second, how long can the almond pulp last until it’s no longer edible (in other words, expiration date?) thanks so much for the idea, I didn’t want to throw all of my almond pulp away, seemed like such a waste! Thanks so much! I was In the middle of a comment and the website reloaded not sure if you got it, but anyways I only got 1 cup of almond flour out of the pulp so I’m trying to make ur cookies would I sPlit all of the ingredients In half? 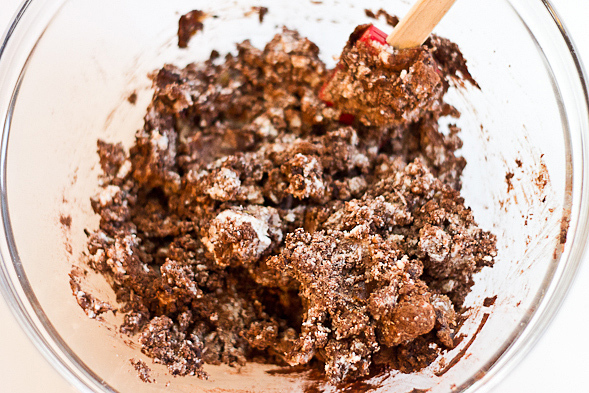 For example 1 cup almond flour , 1/2 cup cacao powder, 1 date, etc etc? Hi Chelsea – Yeah, I would split the ingredients in half if you only got 1 cup. Have fun baking! Help! I split it exactly in half and it’s all dry ingredients! 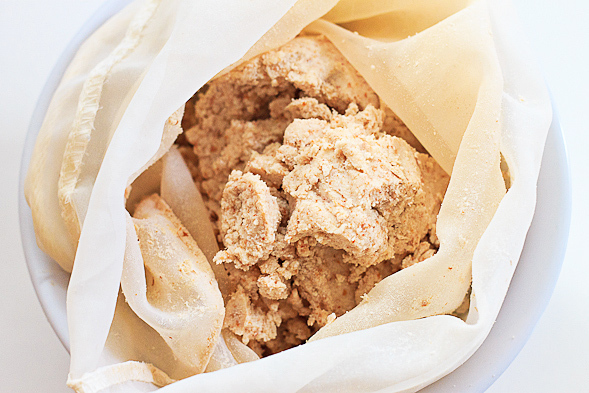 I dehydrated my almond pulp last night and made almond flour (so you used moist almond pulp and I used dehydrated almond pulp! )It’s just a mixture of dry ingredients pretty much even though I did 1/4 cup of almond milk. so maybe I should just add more almond milk or water? what are your thoughts? I’m not a good chef or baker.. thank you so much for your quick responses! No problem 😉 I would add more almond milk, little by little, just until the mixture is pliable enough to roll into balls. Hmm, I’m thinking it would still taste good if I eliminate the sugar and just add more dates. I’ll have to try it out. Thanks for your comment, Novi! Happy you enjoyed the cookies. 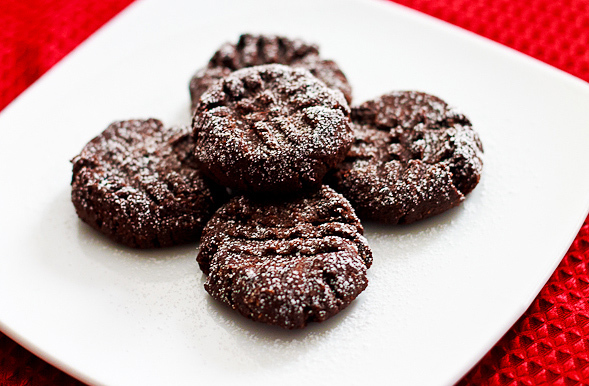 Just made these – they are delicious. thanks! Wonderful, glad you enjoyed them! Is unsweetened cocoa powder ok to use? Hi Kelsey – Yes, definitely. Then you can adjust the sweetness to your taste. Hope the recipe turns out well for you! For the coconut oil – is it 2 tbls *before* you melt it or after? I’m pretty sure the liquid form has a slightly different measurement. Hi Elise – Yes, the flax seeds should be ground flax seed meal. And for the coconut oil, it’s 2 tbls after it’s melted. How did the almond milk turn out by the way? Thanks, Barb! Almond milk was super easy to make and yummy, too. Haven’t tried to make the cookies, yet – looking forward to it. I just made this and they are so yummy! I like the buttery taste of these cookies. thank you for sharing this recipe. YUM! Just made these and they are so good. I have been searching for different recipes to use up my left over pulp (we make probably 3 batches a week, which adds up). I actually used raw cacao vs coco powder and they are fantastic, a very rich chocolate flavour! Thanks!! My 8 year old pushed me to make the milk and cookies and helped today. The almond milk is amazing and the cookies are great too! It is a very mildly sweet cookies recipe easily adjusted with more dates/sugar. I made as is and coated the cookies with generous amount of powdered sugar which immediately tastes sweet then goes mild as you chew.